Description Getting There White Chalk is not allowed! Update as of 8/4/15: as of this week, SOME closures have been lifted in Garden of the Gods. Grey Rock (aka Kindergarten Rock) is now entirely open. The Summit Ridge, East Ledges, and West face (excluding the West face of Tower of Babel) of North Gateway is also open. Tower of Babel closure map 2015. Tower of Babel closures 2015 (West view). The East Face of North Gateway is closed to climbers every year from around Feb. 1 until early August, depending on when the birds fledge. It's not posted out there, but since the closure has been in effect for 20+ years it is incumbent on climbers to know about closures by stopping in at the visitor center and asking. The falcons always nest in a big pothole above the traverse ledge and below the Kissing Camels arch. Map of North Gateway closures. The closure for Gray Rock has been lifted. The closure on North Gateway remains in effect at this time. The closures are in place for the Tower of Babel- please refer to the attached images. As of this posting, there are no other closures, but we anticipate closures for North Gateway and Gray Rock similar to those in years past- but we're waiting until we see confirmed nesting behavior before enacting any closures. We will update this post as closures come in to place or are lifted. 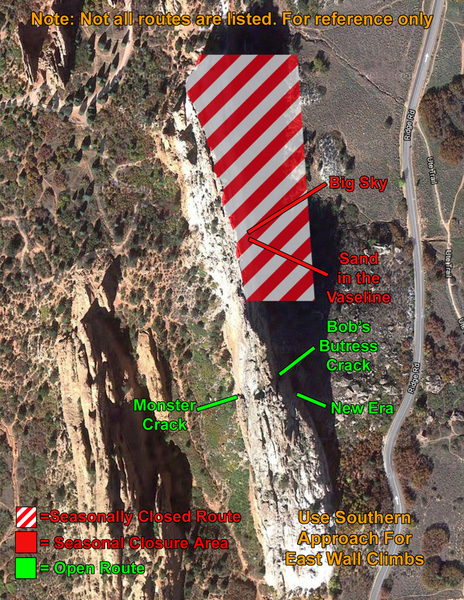 A closure is now in effect for the North half of the East face of Gray Rock- please refer to the attached images. We are monitoring another nesting site of North Gateway, so it is possible that there may be some additional closures on North gateway, depending on what we see. From the Garden of the Gods staff in 2017. Click hereuploads.mountainproject.com…, hereuploads.mountainproject.com…, hereuploads.mountainproject.com…, and hereuploads.mountainproject.com… for another way to view the images. UPDATE (5/22): A closure is now in effect for the North half of the East face of Gray Rock- please refer to the attached images. We are monitoring another nesting site of North Gateway, so it is possible that there may be some additional closures on North Gateway, depending on what we see. Click hereuploads.mountainproject.com… and hereuploads.mountainproject.com… for more images. All closures for the park have been lifted. We don't expect any closures until March of 2017. Map of closure for Grey Rock at GoG. Photo of closure area of Grey Rock in GOG. North Gateway closure reference image. to register to climb. This should only take a few minutes, and is valid until the end of the year (New Year's). We were notified on 10/2/15 that all bird closures have now been lifted. 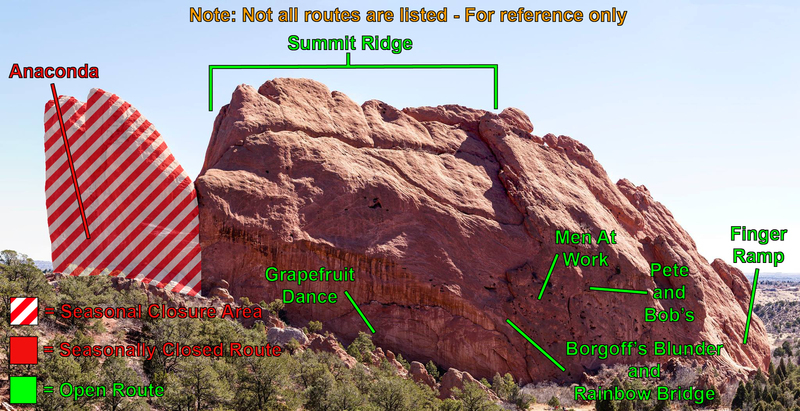 Per Stewart M. Green: the Garden of the Gods Park is now open to rock climbing as of Tuesday, June 2. Per Stewart M. Green: ATTENTION!! 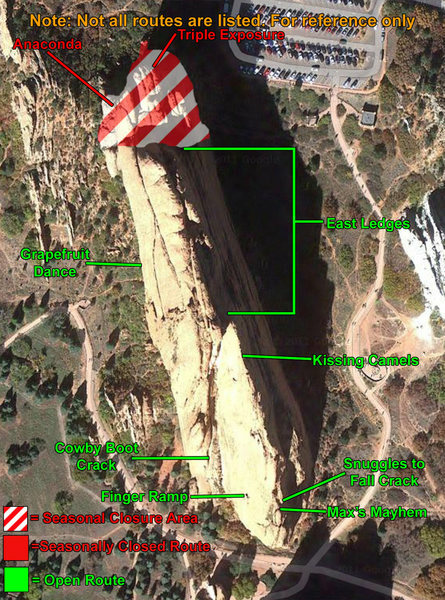 The Colorado Springs Parks Department has CLOSED ALL CITY PARKS, including Garden of the Gods, Red Rock Canyon Open Space, and North Cheyenne Canon, to rock climbing for the upcoming Memorial Day weekend. 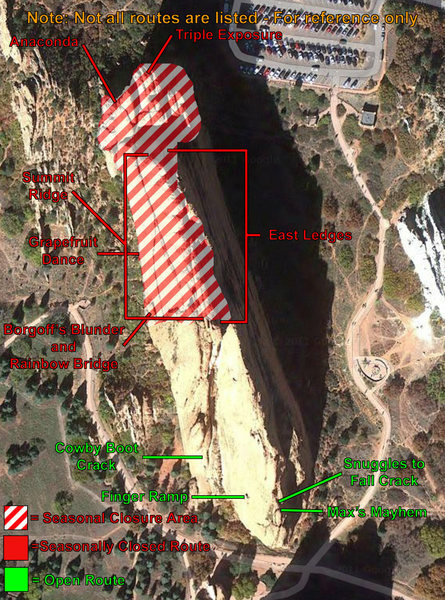 This is due to record rainfall totals in western Colorado Springs which as caused severe trail and parking lot damage, saturated the sandstone cliffs, and is causing parts of cliffs to break off. The parks will be re-evaluated on Monday to determine how the closure will last. Please respect the closures and take care of our precious climbing areas! Image of N Gateway Closures. Closures in Garden of the Gods Park for raptor nesting sites have been lifted. This includes the East face of North Gateway, the East Ledges on North Gateway, and the East face of Grey (Kindergarten) Rock. Closures for Migratory Birds are still in effect - this includes the Tower of Babel. We expect this closure to last in to early Fall. Please refer to the map attached. If you have questions, please stop by the Garden of the Gods Visitor and Nature Center. Climbing closures for Tower of Babel. Prior closures (pre 8/10/14): There are currently two closures in effect, both on North Gateway Rock. The first closures is for the Eastern Face (including the East ledges), which will include routes like Max's Mayhem, Snuggles/Fall Crack, etc. The second closure is for the Tower of Babel on the North end of Gateway Rock, and includes Anaconda, Ryan's Inferno, The Inferno, and Triple Exposure. The routes listed above are for reference, but may not represent all routes affected, and closures may be subject to change. We've provided a map of North gateway showing these closures. North Gateway Closures- East Face and Tower of Babel. Addendum: March 29 - Based on new reports of nesting behavior and of raptors exhibiting signs of stress/defending their nesting sites, we are updating our closures to include Big Sky and Sand in the Vaseline (aka The Route to the Left) on the East face of Grey Rock (aka Kindergarten Rock). 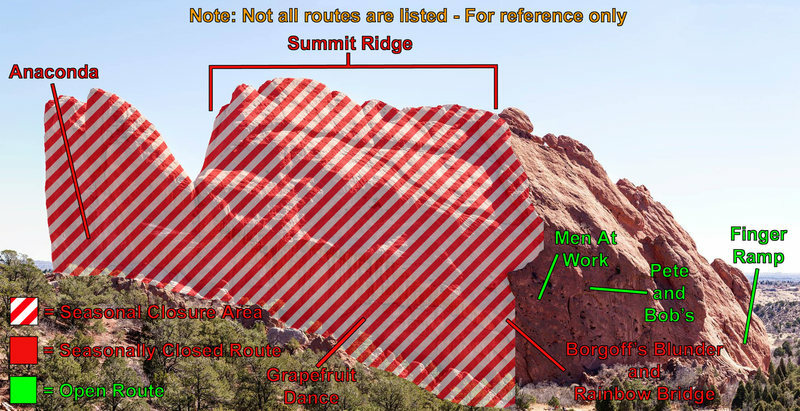 Other routes on the East face near the South Summit such as New Era will remain open, but we ask that climbers approach these routes from the South, and avoid the North end/approach of the East Face while the closure is in effect. This is a reorganizational entry to allow for L->R: sorting of the routes to make sense, we'll create an entry for the west face. Some of this complicated face makes L->R sorting very difficult. To help with allowing L->R sorting, we'll break off the Southwest Face / Finger Face and routes above the Tourist Gully to a distinct area. In addition, the lowest area below the overhung wall makes for difficult L->R sorting, and we'll keep that area unsorted relative to the rest of the face. This subarea will include routes from The Pillar Climb to Water Crack. 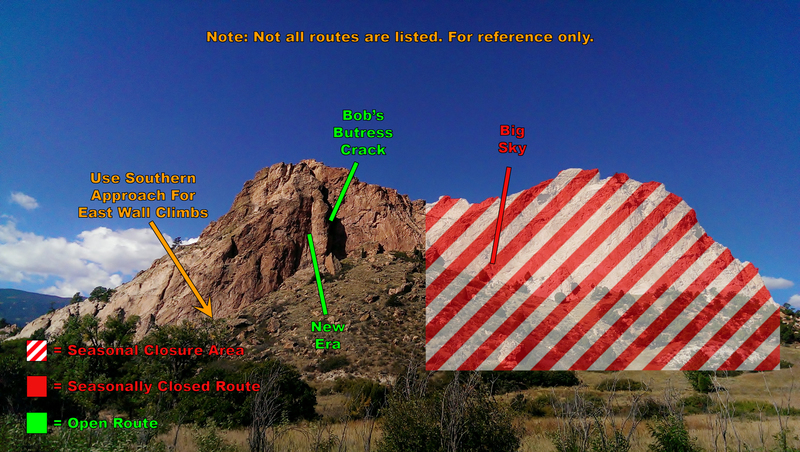 This subarea has the bulk of the routes on North Gateway Rock. Some of it is subject to raptor closures, so make sure you are compliant with the regulations. It is bathed in afternoon sunshine. Park at the North Main Parking Lot. Walk up a designated trail to your desired route. White Chalk is not allowed! The Park staff want to remind the climbing community that white chalk (calcium carbonate) is prohibited in the park due to visual impact. While any chalk use is discourage, chalk substitute that does not discolor the rock may be used. Eco balls are sold at the Visitor Center. When placing closure signange/notifications, our park rangers noted chalk stains on several routes in the closure area (Anaconda and Grapefruit Dance), as well as the Blowouts bouldering area (which were cleaned last year, meaning all the chalk here is new). We are again hoping that the community can come together and address this issue before it requires any action on our part. Access may come into play! 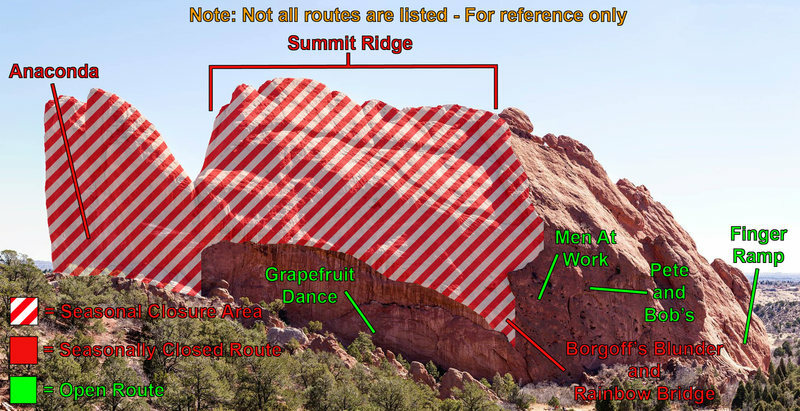 We'd also like to thank the PPCA for their efforts to remove chalk stains in these areas last year and hope that local climbers might consider helping them remove chalk stains from the rock this season- check their website for more info on upcoming events- pikespeakclimbersalliance.o…. Climber: Sean Stellick. Photo: Dancesatmoonrise.